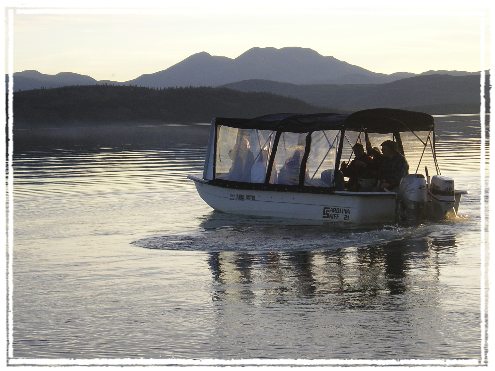 Our Yukon River boat trips are designed for guests who love wilderness and history. Most trips begin from our wilderness home and sled dog kennel at Lake Laberge. (Guests are picked up in Whitehorse.) We travel the Yukon River from Lake Laberge to Carmacks or Dawson (3 to 7 days), following the route taken by most of the gold-seekers who rushed to the Klondike Gold Rush in 1898. While these adventurers mostly used homemade boats and rafts loaded with all their worldly goods, you can travel in a comfortable covered boat. At night, we camp out by the river and go to sleep listening to the sound of the water. Please note that our trips are non-smoking.